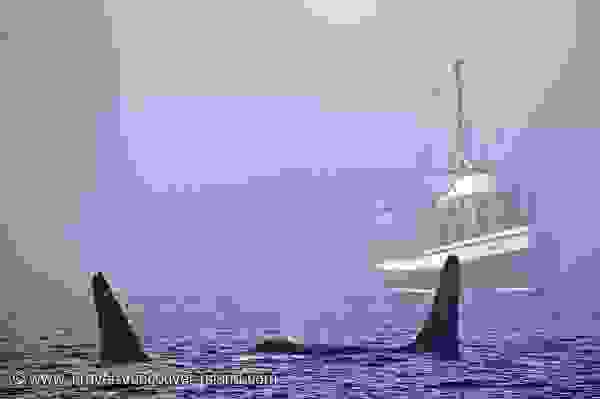 Since the first tour company began taking tourists out to see the Killer Whales of Johnstone Strait, the industry has boomed throughout Vancouver Island in British Columbia. The grand old tour boat 'Gikumi' still plies the waters of Johnstone Strait during the summer months with a human cargo of tourists in search of whales and other marine mammals. Two killer whales and the Gikumi in Johnstone Strait, off Northern Vancouver Island, British Columbia, Canada. Picture of a whale watching tour boat and two large killer whales in Johnstone Strait, Vancouver Island, BC.